The Abode of those who supportthe world through their righteous actions. `A' is a prefix meaning `from all sides, in all resepcts". dhAra is derived from the root dhR- dhAraNe - to support. nilaya is derived from the root `lee - SleshaNe - to stick, to lie on', with the prefix ni-. SrI vAsishTha explains the nAma as - jagad AdhArANAm api dhAraka iti AdHara-nilayaH - He is the Support of all those that are considered the support of the world. This means that He is thesupport of all the deva-s such as brahmA, rudra, indra, the Sun and all the planets and their moons, the pa'nca mahA bhUta-s, etc. Heis also present in every living being as their antaryAmi, supporting them in every act of these beings. "O! Mother Earth! Thosewho strictly adhere to the rules of conduct stipulated for different castes andstages of life, and also scrupulouslyfollow the dictates of the SAstra-s, are your support. On them your burden rests". Note the emphasis here on theadherence to the dharma-s of the varNa- s (castes) and the Asrama-s (stages inlife, such as brahmacarya, gRhasta,etc.). These are the ones because of whom this earth keeps going; these are the ones who are supported by bhagavAn in their righteous observances and conduct - AdhAra-nilayaH. AdhAra bhUtaH nilayAH yasya sa AdhAra-nilayaH. yAn periyan nee periyai enpadanai yAr aRivAr? "It is true that Yousupport everything including all the worlds, the skies, etc. But now You reside inside me by enteringinside me through my ears, and thus I am supporting You inside me. Now Youtell me whether You are supporting me or I am supporting You - whether You are the bigger One or I am the bigger one. You tell me,emperumAn with the cakra that drinks the blood of Your enemies". The above pASuram of AzhvArsupports the alternate interpretation that bhagavAn has as His residence (nilayam)the hearts and minds of those whosupport the varNa and ASrama dharma-s (AdhAra-s), and so He has the nAma AdhAra-nilayaH. for he, integrated, is devoted to Me alone as the highest end". The declaration by Lord kRshNathat the j~nAnI is His own self, once again supports the second interpretationabove. pRthivyAdInAm pa'nca bhUtAnAm AdhAratvAt AdhAra- nilayaH. "I hold that Supremebecause of which the Sun rises, sets, and rests. Nothing surpasses the Will of this Supreme". "None who is born or beingborn, Lord vishNu, has reached the utmost limit of Thy grandeur. The vasthigh vault of heaven hast Thou supported, and fixed earth's eastern pinnaclesecurely". "He within whose threewide-extended paces all living creatures have their habitation". "And entering the earth Iuphold all beings by My strength. I nourish all herbs, becoming thejuicy soma". "Becoming the digestivefire, I function within the bodies of all living beings. In union withinward and outward breaths, I digest the four kinds of food - chewed (like riceetc. ), sucked (like mango fruitetc. ), licked (like medicinal power mixed with honey), and drunk (like water)". "He who dwells in allbeings, who is within all beings, whom all beings do not know, whose body is allbeings, and who controls all beingsfrom within, is your Internal Ruler - the Self, the Immortal". He Who protected the gopAla-s orcowherds from the intense downpour of rain caused by devendra, through the govardhana dhAraNam. a) One Who created the Universe(dhA - to produce, or dhA - to lay upon). b) He Who supports and sustains (dhA - dhAraN poshaNayoSca). c) He Who has no support other than Himself (a-dhAtA). d) He Who `drinks' everything during pralaya (dheT - pAne - to drink). e) One Who is the antaryAmi of the four-faced brahmA. We studied this nAma in Slokam 5 (nAma 43). `dhA - dhAraNa poshaNoyoH dAne ca'- to put, to grant, to produce, to bear. to put, place, lay, put in, lay onor upon (SrI Apte's dictionary), and gives the meaning "The Creator"for the nAma. The detailed explanation is provided under nAma43 (Slokam 5). and is thus the best Preceptor ofdharma. nor is there anything that has not been acquired, and oughtto be acquired. Yet I go on working" (to set an example to others, as explained further inSloka 3.23 of the gItA). and nurturing all His creation. He Who supports the world through His teachings (in the forms of veda-s, gItA etc. ).,and through His own code of conduct(during His incarnations). which is an outstanding example of the adherence to dharma in all its intricacies. that bhagavAn supports (bears) the earth in the form ofananta. This is the same interpretation that Sri Sa'nkara gives as well - anantAdirUpeNa viSvam bibharti iti dhAtA. dadhAti poshayati svajanAn itidhAtA - He Who protects and supports His devotees. One for Whom there is no other support except Himself . SrI vAsishTha also givesthis pATham as an alternative, and gives the same interpretation. He Who drinks all beings during the time of pralaya. dhayati = pibati viSvam iti dhAtA. SrI satya sandha tIrtha givesthe interpretation - dhAtA = dhAraNa poshaNakartA. (in the forms of brahmA, vishNu and rudrarespectively). e) The term dhAtA is also usedto refer to the four-faced brahmA. "nAnmugak kadavuLai SarIramAgak koNDavar" - "One Who has brahmAas part of His body". We all know that our body is at our self's disposal, and its sole purpose is to serve our soul. So also, brahmA, as part ofbhagavAn's body, is there solely to serve emperumAn. He Who is like the bloom of a flower. pushpa - vikasane - to open, to blow,and has - hasane - to smile, to excel, to bloom etc. The nAma signifies the tendernessand pleasing nature of bhagavAn towards His devotees. In the case of those who are blessed with the ability to enjoyHim, He manifests His enjoyable nature gently like a flower thatblossoms in the evening. So He is called pushpa-hAsaH. SrImad SrImushNam ANDavan explains SrI BhaTTar's bhAshyamas a reference to bhagavAn' Sakti-sor powers that are enjoyable for the devotee(svAnubhava SaktInAm), since they blossom forth towards the devoteesas needed for protecting them (since He has Sakti-s or parAkrama-sthat are worthy of enjoyment by the devotee - bhogya bhUta Sakti-s). "His Feet are soft like lotus flowers. HisHands, with which He picks us upwhen He surrender at His Feet, are equally soft like lotus flowers. Then He embraces us with affection, andthe divine beauty of His tiru-muDiand His divine ornaments that we get to enjoy atthat time, is something that will never leave our thoughts ever. Wepray for the blessings of the One with broad eyes (SrI devi) Who isseated on the lotus flower in His broad vaksha sthalam (His chest), so that we are united with Him for ever. 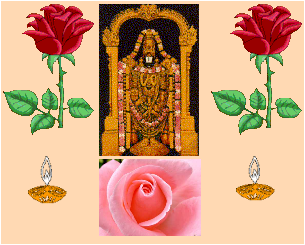 ThisemperumAn is waiting for us in thedivya kshetram by name tiruk-kaNNa puram, which is itself the place full of fragrant lotus flowers drippingsweet honey". kaTTuriakkil tAmarai nin kaN pAdamkai ovvA. He Who has a sweet and enchantingsmile that delights the hearts of His devotees. SrI Sa'nkara interprets the nAma as referring to bhagavAnblossoming into the form theUniverse - mukulAtmanA sthitAnAm pushpANAm hAsavat prapa'nca rUpeNa vikAsaH asya asti iti pushpa-hAsaH - As thebuds of flowers blossom forth, Hehas blossomed forth in th form of the Universe. SrI rAdhAkRshNa SAstri's anubhavam is that bhagavAn makesHis devotees blossom with delightat His thought, and He also blossoms in theirheart and gives fragrance to their thought, and so He is called pushpa-hAsaH. He Who is always of a very pleasingdisposition, who is beyond any sorrow, untainted by any defects,devoid of any desire or want, this is the significance of thisnAma". He points out that, just as it is the dharma (nature) of theflower to blossom beautifully, so also it is the nature of bhagavAnto have a sweet and smiling countenance. He Who is awake day and night,for the protection of thedevotees. SrI vAsishTha indicates theroot for the nAma as "jAgR - nidrAkshaye - to awake. and always thinking of ways to help the jIva- sattain Him. "This purusha (thesupreme) keeps awake while others (the individual souls) are asleep, creating through his eternal willpower. (That is the effulgentand that is Brahman)". SrI kRshNan explains this asbhagavAn keeping wide awake while we are all fast asleep, bestowing all our desires and requeststhat are infinite andnever-ending. SrImad SrImushNam ANDavanpoints out an obvious demonstration of His beingawake, in the form of His looking after us, while we are fast asleep. We all go to bed with the full hope that we will wake up alivethe next morning. And He, as pra-jAgaraH, is there to wake us upsafe and sound, fully rejuvenated, the next morning. SrI Sa'nkara also interpretsthe nAma as One Who is ever awake, as partof His nature - nitya prabuddha svarUpatvAt jAgarti it pra- jAgaraH. This is interpreted by some as indicating that bhagavAn is not affected by nescience,and thus He is not affected by sleep that isa result of tamo guna etc. prakasheNa bhaktAn jAgarayati nidra-rahitAnmuktAn karoti iti pra-jAgaraH. SrI satya sandha tIrtha looksat the nAma as praja + aga + ra. In this interpretation, praja = He Who creates; aga = HeWho resides in the hills ofve'nkaTAcala, ra = ramati = He Who enjoys the company of devoteesby being in ven'kaTAcala. (prakarsheNa janayati lokAn it prajA;ageshu ve'nkaTAdi parvateshu ramata iti aga-raH, prajaSca asau agaraScaiti prajAgaraH. This guNa is alsoreflected in the world through the pa'naca bhUta-s forwhich He is the antaryAmi, and ensures that they are all functioning in theinterest of the jIva-s constantly - vAyu, agni, water,AkASa, etc. never sleep. So also, the Sun never sleeps, the AtmA neversleeps, and the prANa never sleeps. a) He Who rises high. b) He Who leads His devotees to SrI vaikunTham, the highest goal of the jIva-s.
c) He Who is above everyone else in all respects. a) The term Urdhva means`above'. Urdhva-gaH means "One Who rises high". SrI BhaTTar explains the nAma as acontinuation of his explanationof the previous nAma - He Who sleeplessly protects His creation. He devotes Himself to this task ofrakshNam even without sleep,because He aims high in whatever He does, and so He is "Urdhva- gaH". SrI BhaTTar's words are: svabhAva-tu'ngaH - HeWho, by nature, rises high ineverything. His aiming high in everythingis sung by nammAzhvAr through the phrase"karuttin kaN periyan" (tiruvAi. 10.8.8) - "He Who is great whenit comes to paying attention to His goal". nammAzhvAr also identifiesHis paramount goal "kAkkum iyalvinan" (tiruvAi. 2.2.9) - HeWhose Nature it is to protect. It is this paramount goal of His thatis being sung in this nAma. SrImad SrImushNam ANDavanexplains the nAma as "uyarvaRa uyar nalam uDaiyavan yavan avan" (tiruvAi. 1.1.1) - HeWho possesses auspicious qualitiesthat cannot at all be excelled". SrI Sa'nkara explains the nAmaas - sarveshAm upari tishThan Urdhva- gaH- He Who stands above all. b) SrI ananta kRshNa SAtrygives an alternate interpretation that the nAmasignifies that Lord vishNu is the One Who takes us to SrI viakunTham. c) SrI vAsishTha interprets thenAma as - sarveshAm Urdhva sthiti SAlitvAt,sarvataH SreshThatvAt vA Urdhva-gaH - "He who is above everyonein all aspects". He notes that even in real life, the place of knowledge, namely the brain, is above all otherorgans in the body,reflecting an aspect of this guNa of bhagavAn. a) One Who leads His devoteesin the right path. b) He Who follows the path of dharma in His incarnations. patha means path. satrefers to `righteous'. The word AcAra is derived from the root car - gatau - to walk. `AcAra' means `conduct,behavior'. "You are now in thetransitory and unhappy world. To get over it, worship Me". SrI satya sandha tIrtha alsogives an interpretation similar to that of SrI BhaTTar - sat-pathe = san-mArge Acarayati yogyAniti sat- pathAcAraH. He Who follows the path whichgood men have chalked out in His incarnations, is sat-pathAcAraH. nor is there anything un-acquired that ought to be acquired. Yet I go on working (to set an example to others)". sat-pathe AcAro yasya sa sat- pathAcAraH- He Whose conduct or behavior is along the righteous path, is sat-pathAcAraH. This nAma is one of two nAma-sthat is repeated four times in SrI BhaTTar's pATham (the other nAma isnivRttAtmA). The other instances forthe current nAma are: 66, 323, 409 - Sloka-s 8, 35, 44. The root from which the wordprANa is derived is aN - prANane - to breathe,to live, to move. pra- is an upasarga, meaning `in a special way'.The word `prANa' can be translated as `vAyu" or air - prANyate =jIvyate anena iti prANaH = vAyuH. "He is the Giver of prANa,the Taker of prANa, the Purifier of prANa, Enlightener of prANa, and is present everywhereand in everything in the form of prANa. The Supreme Deity,. Lord vishNu,is sung thus as prANa-daH in the Sruti-s". Another independent line ofinterpretation given by SrI vAsishTha is based on the root prA - pUraNe - tofill. In this interpretation, he givesthe derivation - prANaH = pUrNaH, pURNasya dAtA prANa-daH - He Whogives fullness to everything. He gives real-life examples, such asour finding that the minerals are distributed uniformly through ourbodies, we find the milk oozing out from any part of the tree thatis cut, etc. And he also gives the beings all kinds of comforts to livewith. So He is One Who bestows fullness - prANa-daH. Several interpretations of thenAma are possible. One interpretation is: PrANam = jIvanam dadAti iti prANa-daH - He Whosustains life through vAyu orair is prANa-daH. PrANa is one of the five airs that enable the functions of the body (the others being apAna,vyAna, etc.). 66: asya aiSvaryasyaprathamam vishayam - prANam dadAti - Giver of life (strength and vitality) that enables the devoteesto perform eternalkai'nkaryam to Him. SrI BhaTTar gives the example of bhagavAngiving this energy and will to the nitya sUris- to serve Him uninterruptedly- sUribhyaH sadA-darSana-rUpa-svAnubhava paricaraNa- anukUla bala-daH. The nitya sUri-s not only get the ability toserve Him, but also thebenefit of performing kai'nkaryam to Him eternally, beingwith Him constantly, and enjoying Him permanently. This is the firstexample of the foremost action of bhagavAn, signifying His lordshipover all. - ya Atma-dAH bala-dAH (taitt.yajur. 4.1.8) - He gives the Selfand He bestows strength. - SadaivaHprANa AviSati (bR. Upa. 3.5.20) - The vital airs enter the body of a created being, along with theSupreme Divinity. BhagavAn is pRANa-daH also inthe sense that He is the prANa or life for His true devotees, and He gives Himself for them toenjoy. SrI kRshNa dattabhAradvAj captures this thought with his interpretation - prANAn = jIvanam dadAti bhaktebhyaH AtmAna darSayitvA iti prANa-daH. 323. Sri BhaTTarinterprets the sequence of eleven nAma-s starting from nAma 323 as a description of the kUrmAvatAra. In this context, SrI BhaTTarinterprets the term prANa to refer to strength, and the nAma prANa-daH as One Who gave the strength to the deva-sduring the episode describingthe churning of the Milky Ocean. So bhagavAn is called prANa-daH - The Giver of strength. Theamara koSa gives severalmeanings for the word prANa - vital breath, strength, prowess,life etc. - SaktiH parAkrama prANau . (amara koSa 2.8.102), andone of the meanings for the word prANa is seen to be strength. In a sense, bhagavAn not onlygave strength to the deva-s for the purposeof churning the ocean, but He Himself gave His strength to thewhole effort by serving as the support for the huge mountain that wasused as the axle for churning the ocean, in the form of a kUrma (HiskUrma incarnation). He is meditated upon as ananta-bala Saktan (omananta-bala-Saktaye namaH) - One Who is endowed with unlimited strengthand power. "Even the trees with theirflowers, buds, and sprouts withered. All that remained in the forests and gardens were only dryleaves". On the other hand, when rAmareturned from exile to ayodhyA later withsitA, fruits and flowers appeared in plenty even out of season (describedby SrImad vAlmIki in SrImad rAmAyaNam). "BhagavAn is calledprANa-daH because He instills life in the jIva-s whose souls are getting lost because they havebeen poisoned by the sensuouspleasures". Slokam 102 (current): mRtAn parIkshit-prabhRtIn jIvayan prANa-daH- He Who revived the life of parIkshit and others. (Recall thatSrI KrshNa also revived the son of the guru with whom He formally performed gurukula vAsam, by retrieving the son from yama lokam). It is obvious how both SrIBhaTTar and Sri Sa'nkara have explained the nAma-s such that there is no punarukti dosham. but I will not swerve from the word Igive especially to the brAhmaNa-s". - prNAn indiryANi dyati khaNDayati iti prANa-daH - He Who removes the attachment to indriya-s for the sAttvicsouls. - PrakrsheNa aNam sukha virruddha duHkham dyati khaNDayati iti prANa-daH- He Who removes the grief that is opposed to happiness. (NaH = sukham, tad-viruddhatvAt a-NaH = SokhaH, prakrsheNa tama dyati =khaNDayati iti prANa-daH). He Who guides the devotee to surrender to Him with love. nAma 410 – praNamaH, is related. `praNavaH' is an alternate pATham for nAma 410. The interpretation for the pATham `praNamaH' is covered under nAma 410 (Slokam 44). The interpretations for the nAma `praNavaH' are covered here. SrI vAsishTha indicates the derivation of the nAma from the root Nu – stutau – to praise, to commend. pra- is a prefix, meaning `in a special way'. praNauti iti praNavaH, praNamayati iti vA – He Who is praised or worshipped is `praNavaH'. Just as the root bhU becomes bhav, the root Nu becomes Nav (pANini sUtra 3.3.57 – Rdorap). Pra + Nav = praNav. In interpretations below that contain `na' in the root, the na become `Na' by the application of the pANini sUtra 8.4.14 – upasargAt a-samAse'pi NopadeSasya, leading to the change of the `na' to `Na'. and makes them understand the need for surrendering to Him". "The praNava mantra is a manifestation in words of paramAtmA". This mantra reveals Him to us, when we understand the meaning of the mantra. Again, when we understand the deeper meaning of the mantra, it will lead us to worship Him. praNava refers to the mantra represented by the three letters – a, u, and m – "aum" or "OM". This syllable, which is considered a mantra that is the essence of all veda-s, is considered as a manifestation of bhagavAn Himself in sound form. Detailed vyAkhyAna for this mantra has been expounded by the great AcArya-s, and this should be learnt from the AcArya-s. The mantra reminds us, the jIva-s, of the eternal and inseparable relationship of the jIvAtmA to the paramAtmA in a Sesha-SeshI relationship. SrI V. N. Vedanta deSikan has translated SrI M. V. Ramanujacharya's interpretation for the nAma thus: "BhagavAn informs the souls – if they can understand – of the perennial bond of relationship existing between Himself and the individual soul, as imbedded in the secret import of the praNava mantra. The key is that "we should try and understand" this eternal relationship between us and Him, and the true nature of our selves, and surrender to Him. "Focus your mind on Me; Be My devotee; Be My worshipper; Prostrate before Me. You shall come to Me alone. I promise you, truly, for you are dear to Me". It is enlightening to read bhagavad rAmAnuja's explanation of the meaning of the Slokam, so that we truly understand the nature of this obeisance that bhagavAn instructs us to offer to Him. mad-bhaktaH bhava – "atyartham mama priyaH atyarthamatpriyatvena ca niratiSaya priyAm smRti santatim kurushva ityarthaH". "Focus your mind on Me; Be My devotee. Be one to whom I am incomparably dear. Since I am the object of superabundant love, medidate on Me, i.e., practice the succession of memory of unsurapassed love of Me. Such is the meaning". Note the use of word `priyam' thrice in this one sentence of vyAkhyAnam by SrI rAmAnuja. This priyam is the basis of the relationship between Him and us. It is because of His intense love and compassion to us that we should bow to Him, and surrender to Him, and He assures us that He will redeem us as a result. ArAdhanam hi paripUrNa Sesha vRttiH". Translation: "Be My worshipper (yAjI). Here also, the expression `Be My devotee' is applicable. Yaj~na is worship. Worship Me as One exceedingly dear to you. Worship (ArAdhana) is complete subservience to the Lord". Note again the emphasis on `atyartha priyam'. This is the basis of the ArAdhana that bhagavAn is advising us to practice. The complete subservience is based on our utmost love to Him, and not based on any other factor such as fear etc. Translation: "Prostrate before Me". Prostration means `bowing down'. The meaning is `Bow down humbly before Me with great love'. Once again, note the emphasis by bhagavad rAmAnuja on `atyartha priyam kuru' – perform this act with great love. For those who thus surrender to Him, bhagavAn says: mAm eva eshyasi, satyam te pratijAne" – "I make this solemn promise to you. You shall attain Me as a result". These are not mere empty words, because bhagavAn continues: "priyo'si me" – "You are dear to Me". Thus, bhagavAn is not just advising us to worship Him with love as the basis, but He is bound to us by the same love, even more intensely than we can ever command. Elsewhere bhagavAn has already declared: "He in whom there is great love to Me, I hold him also as exceedingly dear to Me. I Myself will enable him to attain Me". (gItA 7.17). SrImad SrImushNam ANDavan points out that the spirit of the gItA Slokam above is best understood if we look at the phrases as "man-manA eva bhava", "mad-bhata eva bhava", "mad-yAjI eva bhava", " mAm eva namas-kuru", "mAm eva eshyasi" – Meditate on Me alone, Worship Me alone, Prostrate only to Me; You will definitely attain Me without any doubt. SrI BhaTTar also gives support from the atharva Siras: pRaNAn sarvAn paramAtmani praNamayati, etasmAt praNavaH | - "The mantra is called praNava mantra, because it makes all souls to obey, and pay respects to, the paramAtmA" (as indicated in the earlier translation, this is considered the greatest privilege by those who understand the significance of the mantra). praNavo nAma paramAtmano vAcaka om-kAraH tad-abhedhopacAreNa ayam praNavaH. praNauiti iti praNavaH – He Who is praised. He gives the sanatkumAra vacanam "praNamantIha yam vedAH tasmAt praNava ucyate" – "The veda-s pay obeisance to Him, He is named praNava". stUyate sadbhiH iti praNavaH" – He Who is praised uniquely by the devoted. prakarshena nayati iti praNavaH – Lord vishNu is called praNavaH because He regulates or puts the world in orderly form in a splendid way. nitya nUtanatvAt praNavaH (prakesheNa nUtanatvAt praNavaH (pra + nava= praNava). (Lord kRshNa declares to arjuna): "O arjuna! I am the taste in the waters, the light in the Sun and the Moon, and the praNava (OmkAra) in all the veda-s, sound in the ether, and manhood in all men". "I shall briefly teach you that abode of which all the veda-s speak, of which the AraNyaka-s and the Upanishad-s mention, desiring which brahmacarya is observed. That is OM". "This letter is indeed Brahman. This very letter is the Supreme. Meditating upon this letter one gets whatever one wants. This is the best support. This is the highewst support. He who knows this is glorified in the world of Brahman". The significance of the praNava mantra is the meditation on the mantra with its meaning in mind, which, at a high level, reveals to us the permanent and eternal relationship between us and the paramAtmA, Lord vishNu. a) He Who trades His role as Master with His devotees, and becomes subservient to them. b) He Who accepts offerings as the antaryAmi of the different deva-s, and bestows benefits. c) He is constantly active, creating `forms and names'. d) He Who bestows benefits according to karma. e) He Who manages the activities of the Universe. f) He Who is the object of praise (paN – stutau – to praise). g) He Who assigns and controls the duties of the different gods. SrI vAsishTha indicates the root for the nAma as `paNa – vyavahAre – to bargain, to bet or stake at play', or `paNa – stutau – topraise'. Most interpreters have used the first meaning, and SrI kRshNa datta bhAradvAj and SrI satya sandha tIrtha have used the second meaning. vyavaharati, vyavahArayati vA viSvam, saH paNaH – He Who transacts the activites of the world, or He because of whom the people of theworld transact their activites, is paNaH. (The term ApaNa means a market or a shop – a place where transactions are conducted). Different interpreters give different anubhavam-s of His `transactions' or dealings with us. a) SrI BhaTTar draws from the Sesha-SeshI bhAvam, or the Lord-servant relationship that exists between Him and us. While this is thenatural relationship between bhagavAn and us, sometimes He chooses to reverse this relationship, and behaves as if He is the servant of the devotee. This is the `transaction', namely the reversal of the role, that Sri BhaTTar enjoys through this nAma – evam teshAm svAmya-dAsya vyatihAreNa vyavaharati iti paNaH – He behaves as though there is a transaction whereby there has been an interchange of the role of the Master-servant relationship between Him and us (vyatihAreNa means `interchangeably, reciprocally'). He acts as if they are the masters and He is their servant. SrI veLukkuDi kRshNan notes that this is what is reflected in tirumazhiSai AzhvAr being called `tirumazhiSaip pirAN', and Lord ArAvamudhan of tirukkuDantai being called "ArAvamudha AzhvAr". Lord kRshNa declares that He considers His true devotees as His AtmA – an example of the reversed role. "….I deem the man of knowledge to be My very self; for he, integrated, is devoted to Me alone as the highest end". BhagavadrAmAnuja's vyAkhyAnam is: "ayam mayA vinA Atma dhAraNa asambhAvanayA mAm eva anuttamam prApyam AsthitaH, ataH tena vinA mama api AtmadhAraNam na sambhavati, tato mama api AtmA hi saH" – This person (the j~naNi who is solely devoted to Him) considers Him to be the highest, and finds it impossible to support himself without Me; so also, I find it impossible to be without him. Thus, verily, He is My self". "Whosoever honors agni and soma with devout heart, through oil and poured oblation, for him, they (agni, soma etc.) in turn protect hissacrifice, preserve him from distress, and grant to the sacrificer great falicity". "Worthy is agni to be praised by the living as by ancient seers; he shall bring hitherword the gods". "agni, god who knows every sacred duty, by goodly paths lead us to riches". "By this (i.e., through sacrifices), please the gods, and the gods will support you. Thus nourishing one another, may you obtain thehighest good". (Note that these deva-s are the bodies of the Lord,and He is their antaryAmi. The offerings to these gods ultimately reach Him only). "The gods, pleased by the sacrifice, will bestow on you the enjoyments you desire. He who enjoys the bounty of the gods withoutgiving them anything in return, is but a thief". "He, the Wise, keeps creating various forms and giving a name to each". He who awards, to those that are entitled, thefruits of their good karma-s, that they have accumulated". SrIrAdhAkRshNa SAstri comments that as a merchant gives merchandise that is commensurate with the amount that is paid to him, bhagavAnmeasures out the phalanx commensurate with the karma; thus, the price for happiness is following the path of dharma, and the price for suffering is one's having followed the a-dharmic path. e) SrI cinmayAnanda explains this guNa of bhagavAn in terms of the functioning of everything in the universe: "PaNaH – The SupremeManager of the Universe. By giving the exact reward for all actions, Lord both orders and justly manages all activities of each individual and directly supervises the interactions between individuals and things constituting this scientifically precise universe". f) SrI kRshNa datta bhAradvAj uses the root paN – stutau – to praise, and explains the nAma as "paNyate stUyate sattva guNavadbhiH itipaNaH” – He Who is worshipped by those who are endowed with a predominance of the sattva guNa. This is also one of the interpretations provided by SrI satya sandha tIrtha – paNyate janaiH stUyate iti paNaH. He is called paNaH because He assigns the respective dutiesto be performed by the different the gods, and controls them in these functions.